For those of you not familiar with Abby Larson's Style Me Pretty, you simply must check it out at http://www.stylemepretty.com. We were initially introduced to the site back in March when we received an invitation by Abby Larson to join their prestigious "Little Black Book" of VIP vendors. After seeing the site, we felt honored to be asked! Being in the wedding industry, we receive emails from wedding sites on a regular basis inviting us to visit and join their site, many even offering a free link, and 95% of the time we are not impressed with what we see. Same ol' cookie cutter type weddings and half the time we don't recognize the names of the companies profiled. Then along came Style Me Pretty and it restored our faith, that yes, there are sites out there catering to brides with discriminating tastes, brides obsessed with style and color palettes and focuses on the details of the wedding. We always notice the details at weddings because that is what sets one wedding apart from another. After we place the cake, I always walk over and check out the tables, flowers, and any details that call my attention. I often get even more insight into who the couple is and what is important to them by looking at their details. We love that Style Me Pretty is a blogsite because this means that every day there is new information to absorb. I try and stop by as regularly as time will permit, and each time I get sucked in to Abby's beautiful color palette's and real wedding features. Rick is also a fan of the site and loves the aesthetic style and presentation and would probably visit it more regularly if he just had the time. 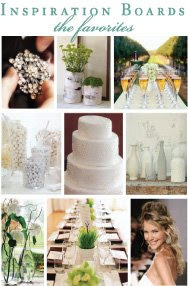 Whether you are planning a wedding or like us, already married :-) , Abby Larson's fabulous site will make you smile, and may just give you the urge to create! Great site, I subscribed to the RSS feed for updates.